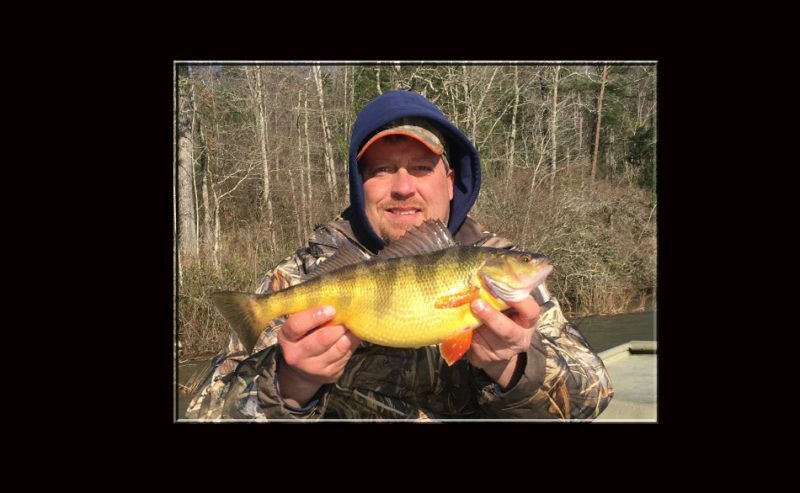 Jeremy Lorenz of Michigan now holds the state record for yellow perch after catching a two pound five ounce fish on Ocoee Number 3 lake in Polk County, on March 26. The previous record was a tie, of a two pound three ounce fish taken by Mr. Trenton McCoy in January of 2017 and the same size fish taken by Mr. Richard Marsich in July of 2018. Lorenz was visiting a cousin, Eric Reed of Birchwood, to fish for a few days. After purchasing a three day license, Lorenz and his cousin headed to Ocoee Number 3. Reed had fished there only once and both anglers headed out early with pan fish in mind, on the dreary Tuesday morning. This would be an exploratory trip. They were on the water by 9:00 a.m. With minnows as bait, they fished several holes in windy, drizzly conditions that lasted throughout the day. With just a few minnows left, Reed saw a bald eagle. Reed referred to something the men’s grandfather had taught them as children, to watch and learn from nature. They headed to the spot the eagle was circling and decided this would be their last hole before heading to shore. To find state record fish or to learn more about fishing, visit tnwildlife.org.